Withings WiFi Scales, Withings Blood Pressure Monitor and Withings Pulse Activity Tracker are devices to measure and send data to the Withings web site, to store them safely, to chart them. Some Withings devices may require installing additional mobile app to send data to Withings web site. If you have Withings WiFi scales configured to send data to the Withings web site, you can enable MyNetDiary automatically download your weigh-ins from the Withings web site. If you have Withings Blood Pressure Monitor plugs into iPhone, iPad or iPod touch to launch the measurement and send data to the Withings web site. 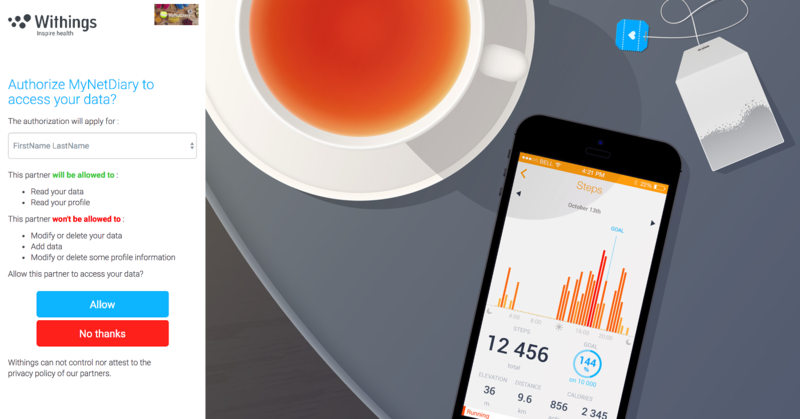 You can enable MyNetDiary automatically download your blood pressure and pulse (heart rate) from the Withings web site. Withings Pulse Activity Tracker captures steps taken, burned calories and resting pulse rate. 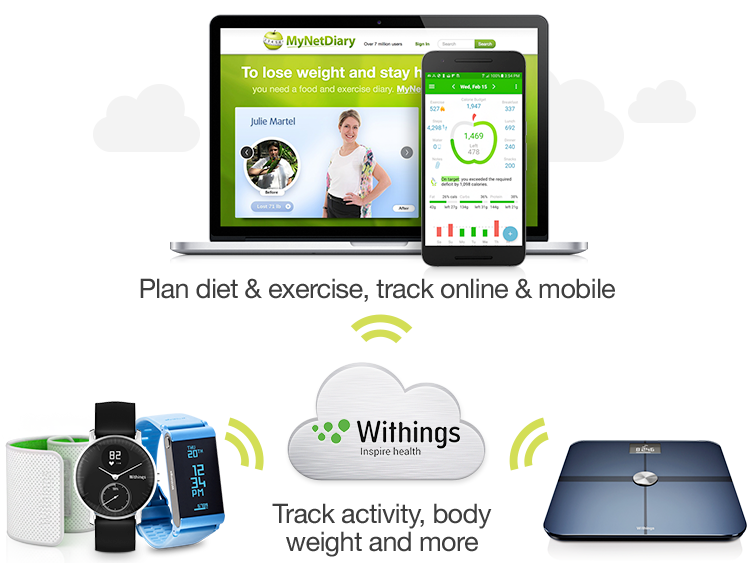 Once synced to your smartphone or tablet, it can be sent to Withings web site. MyNetDiary uploads this information from Withings and makes it available online and on your mobile MyNetDiary apps. MyNetDiary uses burned calories information in daily calorie balance calculations to help you stay fit. How does Withings linking work? Daily calories counted by your Withing activity tracker, recorded in MyNetDiary as an exercise record and included into calorie balance and analysis. Daily steps counted by your Withings activity tracker. Sleep hours recorded by your Withings activity tracker. Weigh-ins, updating your weight measurement records in MyNetDiary. Systolic/diastolic blood pressure and heart rate data, adding both to Daily Tracking and to Measurements in MyNetDiary. After you link to Withings, MyNetDiary performs automatic download once a day or within several minutes after you enter foods in MyNetDiary, one download per hour. 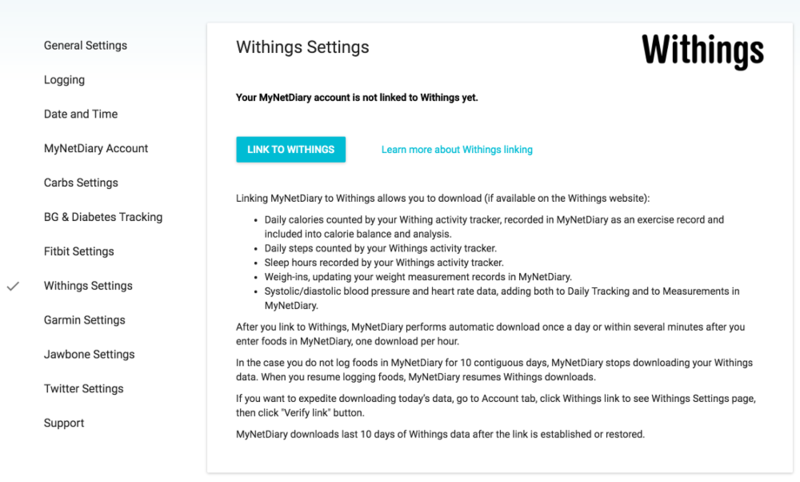 In the case you do not log foods in MyNetDiary for 10 contiguous days, MyNetDiary stops downloading your Withings data. When you resume logging foods, MyNetDiary resumes Withings downloads. If you want to expedite downloading today’s data, go to Account tab, click Withings link to see Withings Settings page, then click “Verify link” button. When you sync Withings device to the Withings website, MyNetDiary receives notification from Withings within several minutes and automatically downloads new data. MyNetDiary downloads last 10 days of Withings data after the link is established or restored. Withings data can be transferred one-way only. By creating a link, you authorize MyNetDiary website to read your Withings data and write these data under your MyNetDIary account. Heart Rate → under Details tab online and on the iPad app, on the Measurements screen of mobile apps, under Trackers or Diabetes tab online. You can choose which data can be downloaded from Withings. 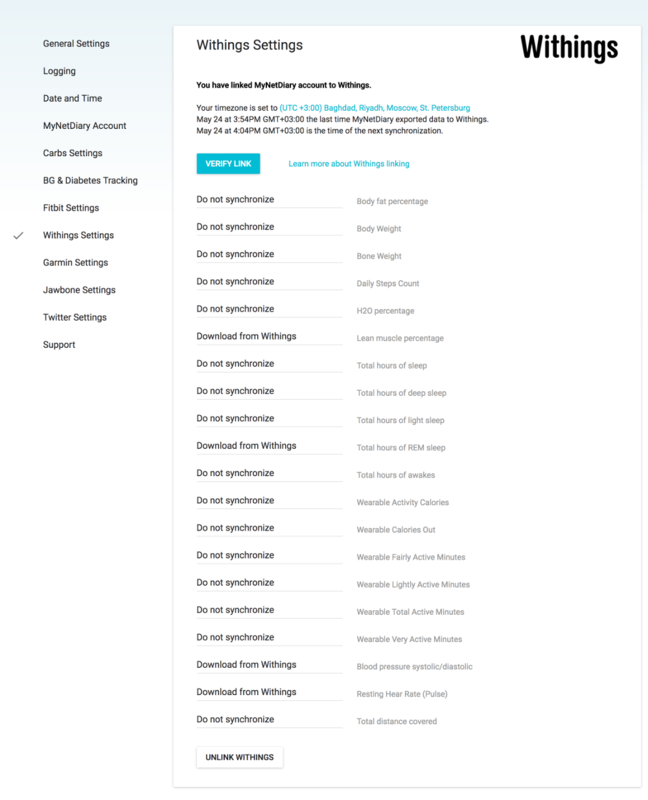 Use Withings Settings page. How do I link MyNetDiary to Withings? Before linking you should have MyNetDiary Maximum account. Sign Up in case you have not done this yet. You can get started by following the directions at Withings website. 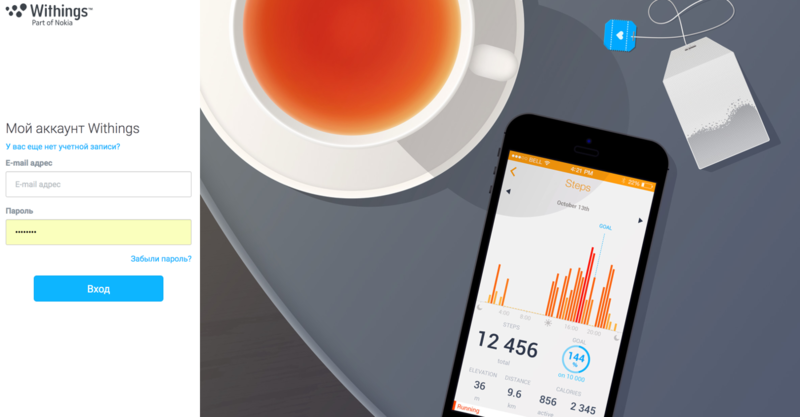 Once you have a Withings account make sure you see the data uploaded from your Withings device to Withings web site. Notice, that this page shows if Withings is already linked and allows you to verify the link. Step 3: Click the "Link to Withings"
You will be redirected to Withings.com where you will need to log in. Once you click Allow button, you will be returned to MyNetDiary.com Withings Settings page where you should see "You have linked MyNetDiary to Withings" message. You can terminate MyNetDiary link at Withings settings page. In case you would like to repeat Withings download for last 10 days, please, use "Verify Link" button.